Of all the pop-up events I did last year, one of my favorite was the Peruvian Independence Day dinner in NOLA, and I am delighted to announce that this year I’ll be back in NOLA as guest chef for another pop-up cocktail and dinner event at Carmo the last weekend in July. 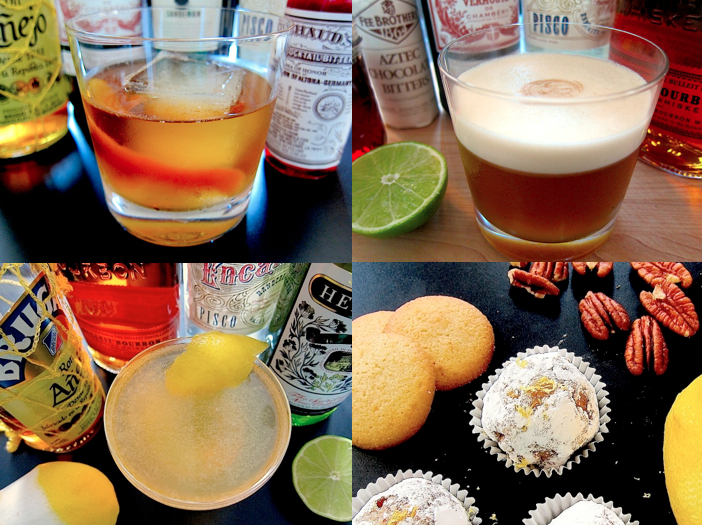 But this week, NOLA is all about celebrating cocktail culture through Tales of the Cocktail. So to honor my love for New Orleans and to toast to all my friends who are there now, I present for your pleasure 3 Pisco cocktails and a dessert, cheers! Start with the Comstock Monday Night Special — Pisco and Sweet Vermouth that combines Rum from the Caribbean with Sherry from Spain to make a cocktail that is strong, dark, and reminiscent of the Vieux Carre or Cocktail a la Louisiane. Follow it with the Saint and the Viceroy, a Pisco and citrus based cocktail that also has Rum but the Bourbon and Herbsaint connects it unmistakably to NOLA. Finish with the Mardi Gras Pisco Sour a cocktail that combines the Peruvian Pisco Sour recipe with chicory infused simple syrup, Bourbon, and chocolate bitters to give it a taste that pays homage to the history of NOLA. The final touch? Dessert of course, but with Pisco. Inspired by the Bourbon Balls of the American South, Pisco Balls combine Peruvian ingredients such as Pisco and raw sugar syrup with pecans, vanilla wafers, and confectioners sugar — in other words, a spirited and sweet blend of traditions from New Orleans and Peru.